Paraguay will move its embassy back to Tel Aviv, Foreign Minister Luis Alberto Castiglioni said less than four months after it followed the United States lead and moved its embassy to Jerusalem. Paraguay followed the US and Guatemala and moved its embassy in May, with then-president Horacio Cartes making the decision in the final months of his five-year tenure which ended in August. He was not eligible for reelection in April, which was won by co-party member Mario Abdo, who said that he was not consulted regarding the embassy move. Abdo is the grandson of a Lebanese immigrant. [The] developments were a stunning reversal in the direction that ties between the two countries were headed. PA Foreign Minister Riyad al-Maleki congratulated Paraguay’s decision, calling it “a new Palestinian diplomatic achievement” and saying he had met Abdo two weeks before. The PA then announced that it intends to immediately open its own embassy in Paraguay in Asuncion. In a radio interview, Duque said he would have liked to have had more debate on the issue, but that he is respectful of decisions made by leaders before their terms expire. The symbolic opening of the US Embassy in West Jerusalem caused a shockwave throughout the world. Now Paraguay is moving its embassy back to Tel Aviv, and Israeli politicians are perplexed. Each side insists that their action contributes to an eventual lasting peace in the Middle East. Obviously, there is no resolution about Jerusalem. 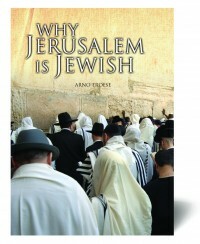 While West Jerusalem is Jewish, the eastern part, especially the Old City, has deep Islamic roots. We believe that only a miracle man, probably Antichrist or the False Prophet, will be able to exact a lasting agreement between the two parties. However, “lasting” from a Biblical perspective is only temporary. In our Bible we read the name Jerusalem over 800 times, and overwhelmingly in relation to Israel. Yet when looking objectively at Jerusalem today, one sees the golden Dome of the Rock, the Al-Aqsa Mosque, and the walls around the Old City—all Islamic built. One must keep in mind that Jerusalem is connected to Eretz Israel; that is, the Promised Land. When it comes to the borders, not one nation on planet earth would agree with the borders defined by God. “In the same day the Lord made a covenant with Abram, saying, Unto thy seed have I given this land, from the river of Egypt unto the great river, the river Euphrates” (Genesis 15:18). #1070 Jerusalem is indeed a stumbling stone for the nations of the world. The future of Jerusalem does not depend on anyone but the Lord. Arno Froese is the executive director of Midnight Call Ministries and editor-in-chief of the acclaimed prophetic magazines Midnight Call and News From Israel. He has authored a number of well-received books, and has sponsored many prophecy conferences in the U.S., Canada, and Israel. His extensive travels have contributed to his keen insight into Bible prophecy, as he sees it from an international perspective.